Among the many virtues of Alvaro del Portillo, the Opus Dei Prelate beatified on Saturday, September 27, 2014, we can include generosity and inclusiveness. Reproduced below is the letter Blessed Del Portillo directed to Archbishop Óscar A. Romero in November 1979, as Romero entered the most difficult period of his ministry, and the last months of his life. Our translation follows below. Through the Opus Dei Chaplain in your dear country, I have received your affectionate letter recalling the celebration of the fiftieth anniversary of the fundation of Opus Dei. I wish to answer immediately to thank you for that expression of affection, and for joining our thanksgiving to the Lord for all the benefits he has bestowed upon His Work in this first fifty years of its existence. I know that the partners and associates of Opus Dei--there as everywhere, thanks be to Go--work with commitment and are motivated only by the desire to serve the Church. I am aware of the fondness they have for you and of the fidelity with which they live the Spirit of the Work, which leads us to echo the instructions of the Reverend Ordinary in all the dioceses in which we work and to direct the carriage--as our Founder, of holy memory, used to say--in the same direction as the diocesan prelate. I beg you to continue to pray for our apostolic work throughout the world. For my own part, I assure you that I will commend you daily during Holy Mass, praying for you and for your labor on behalf of souls which you carry out. Entre las muchas virtudes de Alvaro del Portillo, el Prelado del Opus Dei beatificado el Sábado, 27 de septiembre 2014, podemos incluir la generosidad y la inclusión. Se reproduce a continuación la carta que el Beato Del Portillo dirigió al arzobispo Óscar A. Romero en noviembre de 1979, cuando Romero entró en el período más difícil de su ministerio, y los últimos meses de su vida. Nuestra transcripción sigue a continuación. a través del Consiliario del Opus Dei en esa querida tierra, he recibido su afectuosa carta recordando la celebración del cincuenta aniversario de la fundación del Opus Dei. Deseo contestarle enseguida para agradecer esa muestra de afecto, y que se haya unido a nuestra acción de gracias al Señor por todos los beneficios que ha derramado sobre su Obra en estos primeros cincuenta años de vida. Sé que los socios y asociadas del Opus Dei - ahí, como en todos los sitios, gracias a Dios - trabajan con empeno y movidos sólo por el deseo de servir a la Iglesia. Conozco bien el afecto que le tienen y la fidelidad con que viven el espíritu de la Obra, que nos lleva a secundar las indicaciones del Revmo. Ordinario en todas las diócesis donde trabajamos, y a tirar del carro - como decía nuestro Fundador, de santa memoria - en la misma dirección que el Prelado diocesano. Le ruego que continúe rezando por nuestra labor apostólica en todo el mundo. Por mi parte, le aseguro que le encomendaré a diario, en la Santa Misa, pidiendo por usted y por toda la labor de almas que realiza. Romero agradeció la carta de Mons. del Portillo en su homilía del 23 diciembre 1979, pronunciada tres meses antes de su asesinato. Tra le molte virtù di Alvaro del Portillo, il Prelato dell'Opus Dei beatificato il Sabato 27 Settembre 2014, possiamo includere generosità e inclusività. Riprodotto qui sotto è la lettera del Beato Del Portillo indirizzato a monsignor Oscar A. Romero nel novembre 1979, quando Romero entrò nel periodo più difficile del suo ministero, e gli ultimi mesi della sua vita. La nostra traduzione segue qui sotto. Attraverso il Consigliere dell'Opus Dei in quella terra amata, ho ricevuto la sua lettera affettuosa ricordando la celebrazione del cinquantesimo anniversario della Fondazione dell'Opus Dei. Vorrei rispondere immediatamente a ringraziarvi per l'espressione di affetto, e per la sua unione con il nostro rendimento di grazie al Signore per tutti i benefici che ha elargito la sua Opera in questi primi 50 anni della sua esistenza. So che il partner e soci dell'Opus Dei-lì come ovunque, grazie a Dio-lavorare con impegno e sono motivati solo dal desiderio di servire la Chiesa. Sono consapevole dell'affetto che hanno per voi e della fedeltà con cui vivono lo Spirito dell'opera, che ci porta a risuonare le istruzioni del reverendo ordinario in tutte le diocesi in cui lavoriamo e per dirigere il carro-come nostro Fondatore, di santa memoria, diceva-nella stessa direzione, come il prelato diocesano. Vi prego di continuare a pregare per il nostro lavoro apostolico in tutto il mondo. Per parte mia, vi assicuro che mi ricorderò di voi tutti i giorni durante la Santa Messa, pregherò per voi e per il vostro lavoro per conto delle anime che vi svolgete. “Can you tell me anywhere else in the world where people are studying the homilies of a bishop who’s been dead for 25 years?,” Msgr. Ricardo Urioste asked at the University of Notre Dame conference on Óscar Romero ... in March 2005. The question is even more poignant a decade later, as Notre Dame launches an “International Conference on Archbishop Romero,” September 25 - 27, 2014, buoyed by perceived papal favor and advances in Romero’s canonization cause. The highlight of the conference is bound to be a keynote speech by Rev. Gustavo Gutiérrez, OP, the so-called “Father of Liberation Theology” whose friendship with Cardinal Gerhard Ludwig Müller, the Prefect of the Congregation for the Doctrine of the Faith, has led to a recent rapprochement between the Vatican and the once disfavored Latin American ecclesial movement. Gutiérrez and Müller co-authored a book together, and the Cardinal remarked that the once-suspect movement “should in my opinion be included among the most important currents in 20th century Catholic theology.” Gutiérrez’ talk, focused on Pope Francis, should shed interesting light on the relationship between Romero and Liberation Theology, as seen by one of the great forerunners of the movement. Other highlights of the conference include retrospectives on Romero from some of his collaborators. The aforementioned Msgr. 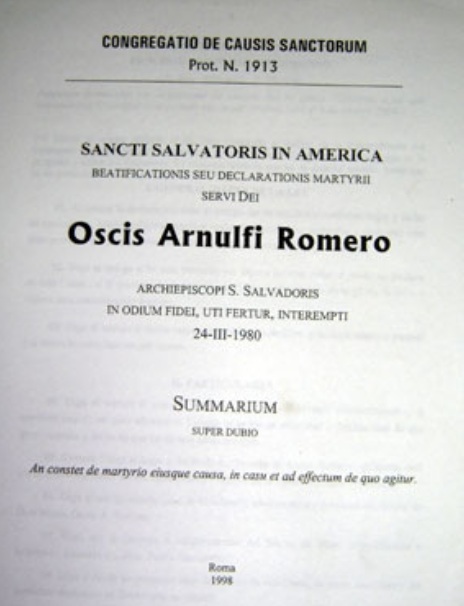 Urioste, who was Romero’s vicar and now serves as President of Fundación Romero in El Salvador, will speak on the Spirituality of Archbishop Romero, which should serve to counter Gutiérrez by situating Romero in the Church with the authority of a close associate, a member of his pastoral team and one who is not as overtly aligned (Urioste is pretty much a rank and file cleric). The Salvadoran human rights attorney Roberto Cuéllar, who was on Romero’s council of legal advisors, will discuss the significant contributions Romero made in the legal field with regard to human rights work. Another portion of the seminar, featured on the last day of the panel, will focus on Romero’s “conversion”—and will feature mostly academic presentations on that subject. Although I was not invited to the conference (but I provided some research assistance to a friend who is presenting at the conference) I offer these overview observations here. As a starting point, Msgr. Urioste’s 2005 comment is still the best insight to be had: the fact that we are still having Romero conferences, that we still have not exhausted the exploration of this Catholic figure’s legacy is the biggest take-away of all. This conference and all Romero discussions will make a difference to the extent they acknowledge and explore this starting fact, and begin to delve into why Romero remains so interesting and so compelling so many years on. Particularly if we are on the verge of a beatification, the world will be eager to understand what makes this man a saint. What is different at this conference which will provide the best opportunity for the gathering to provide a fresh contribution is the effect that a Latin American pope has brought to the scene. Romero famously predicted that, if killed, he would “arise in the Salvadoran people.” But he has done more than that—he has arisen in the Vatican, and that’s headline news. Fr. Gutiérrez can talk about that because it’s not just Pope Francis—Fr. Gutiérrez’ friend Card. Müller is also a Romero admirer. Julian Filochowski, Chairman of the Romero Trust in the UK will also give a talk about Romero and the Popes which should shed light on this story. Finally, this conference, like many Romero discussions, will spend more energy exploring Romero’s conversion. This assembly has the sophistication and intelligence required to develop the concept beyond the simplifications and exaggerations of the past. One of the presenters, Fordham University’s Michael E. Lee, has written compellingly about the gradual and painstaking process that Romero undertook, whereby he grappled with the goliath questions posed by the harsh Salvadoran reality and evolved along the way. Perhaps we will hear something new. Super Martyrio will be keeping tabs on goings on in South Bend. Speaking at the 65th Annual Religion Newswriters’ Association Conference, Todd Johnson cited the case of Archbishop Óscar A. Romero of El Salvador to illustrate the difficulty in counting the number of Christian martyrs. Johnson is an expert on religious demography from Gordon-Conwell Theological Seminary. He noted that Archbishop Romero is seen as martyr, but the motivation for his killing is contested. In gauging whether a particular death is martyrdom, he noted, the motives of the killers are the critical consideration. Thus, Johnson concluded, to assess martyrdom, one first has to conclusively settle the related controversies. 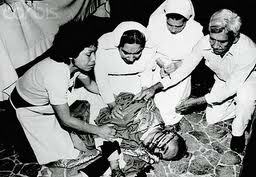 Perhaps unlike Prof. Johnson, I see ways to cut through the controversy and establish conclusively that Archbishop Romero died a martyr of the Church with any of three models of martyrdom. The first two paths toward martyrdom for Óscar Romero are paradigms that have been used frequently to settle close calls; while the third is a straight-forward application of the legal standard traditionally used by the Church to establish martyrdom. All three lead to the same conclusion and, if you follow my reasoning, I think you’ll agree that there really is no doubt of Romero’s martyrdom. Second, Óscar Romero was killed in “Odium Iustitiae.” This argument can mean different things to different commentators, so let us state it as simply as possible. A generally accepted formulation of martyrdom is a death brought about out of “hatred of the Christian faith or those Christian virtues which are part and parcel with living the Christian faith.” Accordingly, if an abortion activist killed a priest who had spoken out against abortion, the Church would resist as reductionist the argument that the act was merely a “politically-motivated crime,” if the defense of life constitutes a virtue that is “part and parcel with living the Christian faith.” Similarly, when we say “odium iustitiae,” we simply mean that Christian justice or the Social Doctrine of the Church constitutes an important virtue, “part and parcel with living the Christian faith,” such that hatred of this important part has the same effect as hatred of the whole. Saints like Fr. Alberto Hurtado (1901-1952, canonized by Pope Benedict in 2005) and Bishop Rafael Guízar (1878-1938, canonized by Pope Benedict in 2006), who were champions of social justice and identified with the cause of the poor, exemplify the heroic quality of the virtue involved. Third, and finally, Óscar Romero was killed in “Odium Fidei” —plain and simple. According to most observers, Romero was killed on Monday, March 24, 1980 as a direct reaction to the sermon he pronounced the day before, on Sunday, March 23, in which he ordered soldiers to disobey orders to kill civilians, as contrary to the Law of God. Msgr. Ricardo Urioste was Romero’s vicar. “I think it was probably his death sentence,” says Urioste. “They said, ‘This man is going to make the soldiers rise up against us and will put us in dire straits’—so they decided to kill him.” It was the 1980 version of “Who will rid me of this turbulent priest”—an expression that seems on its face to be strictly political, but which has profound theological content. St. Thomas Becket (1118-1170), of whom the “turbulent priest” phrase was spoken, was not murdered simply because he opposed the King: he was killed for defending the legal jurisdiction of Church courts over clergy. St. Thomas More (1478-1535) was not killed simply for opposing the King: he was killed for defending papal supremacy over the crown. 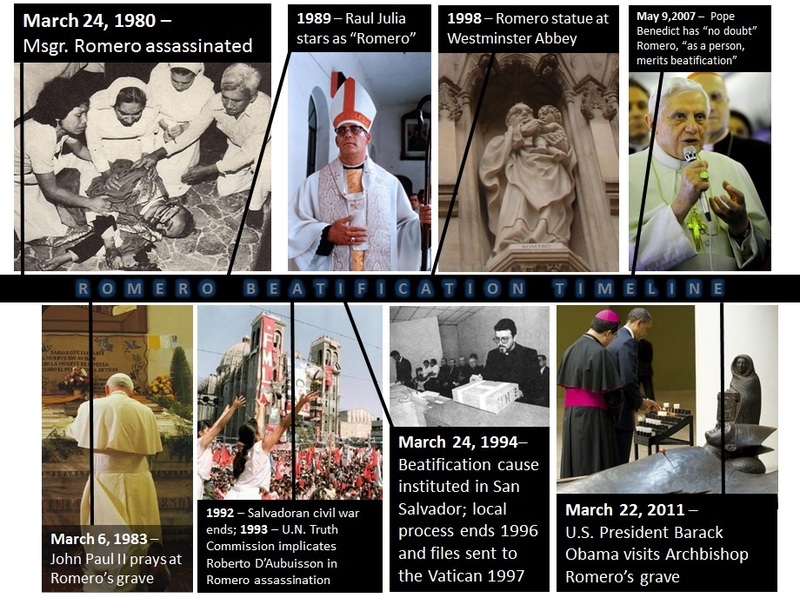 And Romero was not killed just for opposing the regime: he was killed for defending the supremacy of the Law of God over military orders to kill peasants. “Before an order to kill that a man may give, God’s law must prevail: ‘Thou shalt not kill!’ No soldier is obliged to obey an order against the law of God. No one has to fulfill an immoral law,” he had said. For that, he was killed. Doubtless, the question of Romero’s assassination bears both political as well as theological repercussions. For as Pope Benedict told the Congregation for the Causes of Saints in 2006, modern persecutors now “seldom explicitly show their aversion to the Christian faith or to a form of conduct connected with the Christian virtues, but simulate different reasons, for example, of a political or social nature.” And as he said at a shrine for modern martyrs in 2008, martyrs include those who have “sacrificed themselves, undaunted by threats and dangers, in order not to abandon the needy, the poor or the faithful entrusted to them.” ... Like Óscar Romero. En su intervención en la 65 ª Religion Newswriters’ Association Conference, Todd Johnson citó el caso de monseñor Óscar A. Romero de El Salvador para ilustrar la dificultad de contar el número de los mártires cristianos. Johnson es un experto en demografía religiosa del Gordon-Conwell Theological Seminary. Señaló que Mons. Romero es reconocido como mártir, pero la motivación de su asesinato es disputada. Para determinar si una muerte en particular es un martirio, señaló, los motivos de los asesinos son la consideración más importante. Por lo tanto, concluyó Johnson, para evaluar el martirio, primero hay que resolver las controversias relacionadas. Quizás a diferencia del Prof. Johnson, yo si veo maneras de eliminar la controversia y establecer de manera concluyente que Mons. Romero murió como un mártir de la Iglesia con cualquiera de tres modelos del martirio. Los dos primeros caminos hacia el martirio para Óscar Romero son paradigmas que se han utilizado con frecuencia para resolver casos cerrados; mientras que el tercero es una aplicación directa de la norma legal, tradicionalmente utilizada por la Iglesia para establecer el martirio. Los tres llevan a la misma conclusión y, si sigue mi razonamiento, creo que estará de acuerdo que realmente no hay duda sobre el martirio de Romero. En segundo lugar, Óscar Romero fue asesinado en “Odium Iustitiae”. Este argumento puede significar diferentes cosas para diferentes comentaristas, así que lo afirmamos de la manera más sencilla posible. Una formulación generalmente aceptada del martirio es una muerte provocada por “odio a la fe cristiana, o las virtudes cristianas que forman parte integrante del vivir la fe cristiana”. Por ejemplo, si un activista pro-aborto mata a un sacerdote que se había pronunciado en contra del aborto, la Iglesia resistiría por reduccionista al argumento de que el acto no era más que un “crimen por motivos políticos”, cuando la defensa de la vida constituye una virtud que es “parte integrante del vivir la fe cristiana”; del mismo modo, cuando decimos “odium iustitiae”, simplemente significa que la justicia cristiana o la Doctrina social de la Iglesia constituye una virtud importante, “parte integrante del vivir la fe cristiana”, de tal manera que el odio a esta parte importante tiene el mismo efecto que el odio a la totalidad de la fe. Santos como el P. Alberto Hurtado (1901-1952, canonizado por el Papa Benedicto XVI en 2005) y Mons. RafaelGuízar (1878-1938, canonizado por el Papa Benedicto XVI en 2006), que fueron campeones de la justicia social y se identificaron con la causa de los pobres, ejemplifican la calidad heroica de esta virtud. En tercer lugar, y por último, Óscar Romero fue asesinado en “Odium Fidei”–estricta y directamente hablando. Según la mayoría de los observadores, Romero fue asesinado el Lunes, 24 de marzo 1980 como una reacción directa al sermón que pronunció el día anterior, el domingo 23 de marzo, en la que ordenó a los soldados a desobedecer órdenes de matar a civiles, como contrarias a la Ley de Dios. Mons. Ricardo Urioste fue vicario de Romero. “Yo creo que debió ser su sentencia de muerte probablemente”, dice Urioste. “Ellos dijeron, ‘Bueno este hombre nos va a sublevar a todos los soldados y nos va a poner en apuros muy grandes así que decidieron matarlo”. Fue la versión de 1980 de “¿Quién me librará de este sacerdote turbulento” –una expresión que parece a primera vista ser estrictamente política, pero que tiene profundo contenido teológico. Santo Tomás Becket (1118-1170), de quien la frase “sacerdote turbulento” fue dicha, no fue asesinado simplemente porque se opuso al rey: fue asesinado por defender la jurisdicción de los tribunales de la Iglesia sobre el clero. Santo Tomás Moro (1478-1535) no fue asesinado simplemente por oponerse al rey: fue asesinado por defender la supremacía papal sobre la corona. Y Romero no fue asesinado simplemente por oponerse al régimen: fue asesinado por defender la supremacía de la ley de Dios sobre las órdenes militares de matar a campesinos. “Ante una orden de matar que dé un hombre, debe de prevalecer la Ley de Dios que dice: ¡No matar! Ningún soldado está obligado a obedecer una orden contra la Ley de Dios. Una ley inmoral, nadie tiene que cumplirla”, había dicho. Por eso, fue asesinado. Sin duda, el asesinato de Romero lleva repercusiones tanto políticas como teológicas. Como dijo el Papa Benedicto a la Congregación para las Causas de los Santos en 2006, el perseguidor moderno hoy “cada vez trata de manifestar de modo menos explícito su aversión a la fe cristiana o a un comportamiento relacionado con las virtudes cristianas, pero que simula diferentes razones, por ejemplo, de naturaleza política o social”. Y como dijo en un santuario para los mártires modernos en 2008, los mártires incluyen aquellos que se “se inmolaron por no abandonar a los necesitados, a los pobres, a los fieles que les habían sido encomendados, sin miedo a amenazas y peligros”... Como Óscar Romero. Parlando al 65 ° Religion Newswriters Association Conference, Todd Johnson ha citato il caso di monsignor Oscar A. Romero di El Salvador per illustrare la difficoltà di contare il numero di martiri cristiani. Johnson è un esperto di demografia religiosa da Gordon-Conwell Theological Seminary. Johnson ha osservato che Mons. Romero è visto come martire, ma la motivazione per la sua uccisione è contestata. Nel valutare se un particolare morte è un martirio, ha osservato, i motivi delle assassini sono la considerazione critica. Così, Johnson ha concluso, per valutare il martirio, si deve di prima risolvere definitivamente le relative controversie. Forse a differenza del professore, io vedo modi per eludere le polemiche e stabilire con certezza che Mons. Romero morì martire della Chiesa con qualsiasi dei tre modelli di martirio. I primi due percorsi verso il martirio per Óscar Romero sono paradigmi che sono stati spesso utilizzati per risolvere casi dubbi; mentre il terzo è una applicazione diretta della norma giuridica tradizionalmente usata dalla Chiesa per stabilire il martirio. Tutti e tre portano alla stessa conclusione e, se seguite il mio ragionamento, penso che sarete d’accordo che non c’è davvero alcun dubbio del martirio di Romero. In primo luogo, Óscar Romero è un “martire della carità.” Papa Francesco apparve ad approvare questo percorso alternativo al martirio nel mese di agosto, quando ha detto che il martirio include essere ucciso “per aver fatto le opere che Gesù ci comanda, con il prossimo.” San Lorenzo (c. 225-258) è il primo esempio. La leggenda dice che, di fronte la confisca della ricchezza della Chiesa, da parte delle autorità romane, li distribuì ai poveri per evitare il sequestro da parte di Roma. Poi, quando gli fu ordinato di consegnare i tesori della Chiesa, ha presentato i poveri e ha detto che queste erano le veri tesori della Chiesa. Un altro esempio, da tempi moderni, è San Massimiliano Kolbe (1894-1941), che si offrì di prendere il posto di un evaso del campo di concentramento che stava per essere messo a morte. Come San Lorenzo, Romero ha dimostrato una sorprendente sollecitudine evangelica per i poveri, e fonda la sua azione ‘provocatoria’ su quella preoccupazione. Come San Massimiliano, Romero si è messo in pericolo accettando di prendere il posto di quelli già in pericolo: “Vi prego di credermi, fratelli e sorelle, chiunque commessi ai poveri devono subire la stessa sorte dei poveri”, ha detto. “E in El Salvador conosciamo il destino dei poveri: è di essere ‘scomparso’, è di essere torturato, è di essere imprigionato, è di essere trovato morto”. In secondo luogo, Óscar Romero è stato ucciso in “Odium Iustitiae.” Questo argomento può significare cose diverse per diversi commentatori, quindi cerchiamo di affermare nel modo più semplice possibile. Una formulazione generalmente accettata del martirio è una morte provocata da “odio alla fede cristiana o di quelle virtù cristiane che sono parte integrante di vivere la fede cristiana.” Di conseguenza, se un attivista aborto ha ucciso un sacerdote che aveva parlato contro l’aborto, la Chiesa resisterà come riduzionista la tesi secondo cui l’atto era semplicemente un “delitto a sfondo politico,” se la difesa della vita costituisce una virtù che è “parte integrante di vivere la fede cristiana.” Allo stesso modo, quando diciamo “odium iustitiae”, vogliamo dire che la giustizia cristiana e la dottrina sociale della Chiesa costituiscono una virtù importante, “parte integrante di vivere la fede cristiana”, in tale modo che l’odio di questa parte importante ha lo stesso effetto come l’odio di tutto. Santi come p.Alberto Hurtado (1901-1952, canonizzato da Papa Benedetto XVI nel 2005) e Mons.Rafael Guízar (1878-1938, canonizzato da Papa Benedetto XVI nel 2006), che sono stati campioni della giustizia sociale e identificato con la causa dei poveri, esemplificano la qualità eroica della virtù coinvolti. In terzo luogo, infine, Óscar Romero è stato ucciso in “Odium Fidei”— in termini diretti. Secondo la maggior parte degli osservatori, Romero è stato ucciso il Lunedi, March 24 1980 come reazione diretta alla predica pronunciata il giorno prima, Domenica, 23 marzo, in cui ha ordinato ai soldati di disobbedire agli ordini di uccidere i civili, come contraria alla legge di Dio. Mons. Ricardo Urioste stato vicario di Romero. “Penso che probabilmente era la sua condanna a morte”, dice Urioste. “Hanno detto, ‘Questo uomo farà i soldati, insorgere contro di noi e ci metterà in grande difficoltà’—così hanno deciso di ucciderlo”. E’ stata la versione del 1980 di “Chi mi libererà da questo prete turbolento”—espressione che sembra sulla sua faccia di essere strettamente politica, ma che ha profondo contenuto teologico. San Tommaso Becket (1118-1170), il “prete turbolento” di cui questa frase fu pronunciata, non è stato ucciso solo perché si oppose al re: è stato ucciso per difendere la giurisdizione dei tribunali della Chiesa sopra clero. San Tommaso More (1478-1535) non è stato ucciso solo per opporsi al re: è stato ucciso per aver difeso la supremazia papale sopra la corona. E Romero non è stato ucciso solo per opporsi al regime: è stato ucciso per difendere la supremazia della Legge di Dio su ordini militari di uccidere contadini. “Prima di un ordine di uccidere che un uomo può dare, la legge di Dio deve prevalere: ‘Non uccidere!’ Nessun soldato è obbligato a obbedire a un ordine contro la legge di Dio. Nessuno deve adempiere una legge immorale”, aveva detto. Per questo, è stato ucciso. Senza dubbio, la questione dell’assassinio di Romero porta ripercussioni politici e ripercussioni teologiche. Ma come Papa Benedetto ha detto la Congregazione per le Cause dei Santi nel 2006, il tiranno moderno ora “sempre meno cerca di evidenziare in modo esplicito la sua avversione alla fede cristiana o ad un comportamento connesso con le virtù cristiane, ma simula differenti ragioni, per esempio di natura politica o sociale”. E come hadetto in un santuario per i martiri moderni, nel 2008, i martiri sono coloro che vengono “immolati per non abbandonare i bisognosi, i poveri, i fedeli loro affidati, non temendo minacce e pericoli”. ... Così come Oscar Romero. Oh! Jesus, Eternal Shepherd, You have made Archbishop Oscar Romero a living example of faith and charity, and have granted him the grace to die at the foot of the altar in a supreme act of love for You. Grant us, if it is Your will, the grace of his beatification. May we follow his example of love for Your Church, for Your Word and the Eucharist; and may we love You in the poorest and the neediest. We ask this through the intercession of the Virgin Mary, Queen of Peace. Amen. This month’s Triennium reflection focuses on Romero at the seminary. Super Martyrio ran an extensive reflection on Romero’s seminary career earlier this year, which readers may find appropriate for this meditation. “Romero not only studied in Rome but he lived there,” we read in that post. “Most important of all, Rome is a harbinger of Romero's ministry as Archbishop in San Salvador three decades later. Rome is a preview of his pastoral themes: war, poverty, and the Church’s response to these calamities.” Please take a moment to peruse it. Next month: Young Romero’s love for the poor. ¡Oh! Jesús, Pastor Eterno: Tú hiciste de Monseñor Óscar Romero un ejemplo vivo de fe y de caridad, y le concediste la gracia de morir al pie del altar en un acto supremo de amor a Ti. Concédenos, si es Tu voluntad, la gracia de su beatificación. Haz que sigamos su ejemplo de amor por tu Iglesia, por tu Palabra y la Eucaristía; y te amemos en los más pobres y necesitados. Te lo pedimos por la intercesión de la Virgen María, Reina de La Paz. Amén. La reflexión del Trienio para este mes se centra sobre Romero en el seminario. Súper Martyrio publicó una extensa reflexión sobre la carrera seminarista de Romero a principios de este año, lo que sería apropiada para esta meditación. “Es importante señalar que Romero no sólo estudió en Roma—sino que vivió allí”, se desprende en esa nota. “Sobre todo, Roma es un presagio de lo que será el ministerio de Monseñor Romero en San Salvador tres décadas más tarde. Roma es también una vista previa de sus temas pastorales: la guerra, la pobreza, y la respuesta de la Iglesia a estas calamidades”. Favor de tomar un momento para estudiar esta reflexión. El mes que viene: el joven Romero y su amor por los pobres. O! Gesù, Pastore eterno, Tu hai fatto Mons. Oscar Romero un esempio vivente di fede e di carità, e gli hanno concesso la grazia di morire ai piedi dell'altare in un supremo atto di amore per Te. Concedici, se è tua volontà, la grazia della sua beatificazione. Possiamo seguire il suo esempio di amore per la Tua Chiesa, per la Tua Parola e l'Eucaristia; e possiamo amarti nei più poveri ei bisognosi. Te lo chiediamo per intercessione della Vergine Maria, Regina della Pace. Amen. La riflessione Triennio di questo mese si concentra su Romero in seminario. Super Martyrio ha una vasta riflessione sulla carriera in Seminario di Romero all'inizio di quest'anno, che i lettori possono trovare adeguata per questa meditazione. “Romero non ha semplicemente studiato a Roma—lui ha vissuto lì”, si legge in questo post. “Più importante di tutto, Roma è una prefigurazione di ciò che il ministero di Romero come Arcivescovo di San Salvador tre decenni più tardi sarà. Roma è anche un’anteprima dei suoi temi pastorali: guerra, miseria, e la risposta della Chiesa a queste calamità”. Si prega di prendere un momento per sfogliare esso. Il prossimo mese: l'amore del giovane Romero per i poveri. 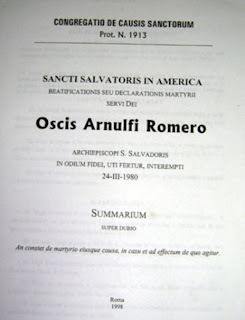 The «positio super martyrio»—the documentation regarding the martyrdom—of Archbishop Óscar A. Romero of El Salvador has been completed and was handed off by the postulators of the cause to four theologians of the Congregation for the Causes of Saints who will examine it from a theological point of view, reports Msgr. Jesús Delgado, vicar general of San Salvador, at a meeting of Sant'Egidio in Antwerp. When the theologians have completed their examination, they will send the documents to a commission of four cardinals and then to the Pope, says Delgado. Msgr. Delgado spoke today at a roundtable on “Martyrs in Our Times” and the figure of Romero, and has provided new details about the complicated path the Romero cause traveled in recent years. For example Delgado explained that Pope Benedict had unblocked the case a few weeks before his resignation, but after his departure the process was stopped again. Then came Francis and ordered the case to be unblocked and it has now assumed a normal path, according to Delgado. With this development, we can truly say that the process has technically reached its final stage. Delgado is of the hope of a quick result, in line with the wishes of Pope Francis expressed last month. Msgr. 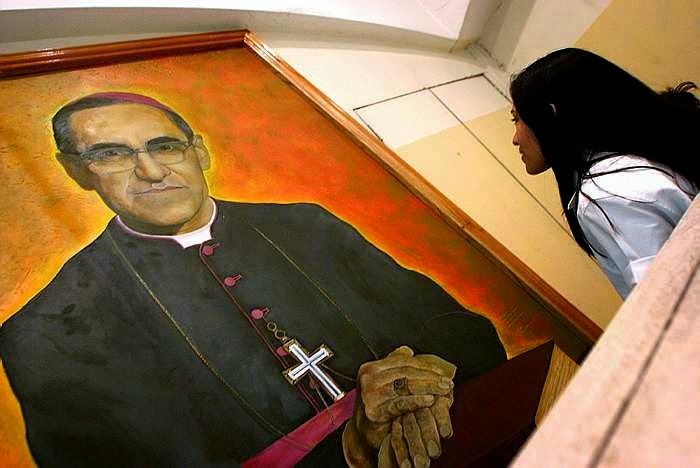 Delgado is confident that Romero will be beatified “next year—either March 24 or August 15.” March will be the 35th anniversary of the assassination; August will be Archbishop Romero’s 98th birthday. The process was started in 1993 with the Archbishop of San Salvador’s announcement of his intent to proceed and with the CCS’ permission to proceed. By November 1996 the archdiocesan investigation of the cause was complete when the Archbishop approved the investigation’s findings and sent documentation to the CCS, and by 1998 all the necessary records had been submitted to the Congregation. Subsequently the cause was again referred to the CDF apparently on the objection of certain Latin American cardinals who demanded a study of Romero’s concrete pastoral actions. Thereafter the cause apparently was stalled. El «positio super martyrio», la documentación sobre el martirio de Mons. Óscar A. Romero de El Salvador ya se completó, y fue presentada por la postulación de la causa a cuatro teólogos de la Congregación para las Causas de los Santos que la examinarán desde el punto de vista teológico, anuncia Mons. Jesús Delgado, vicario general de San Salvador, en el marco de la reunión de San Egidio en Amberes. Cuando los teólogos hayan terminado este examen, enviarán los documentos a una comisión de cuatro cardenales, y luego va a las manos del Papa, dice Delgado. Mons. Delgado habló hoy en una mesa redonda sobre “Los mártires en nuestros tiempos” y de la figura de Romero, y ha proporcionado nuevos detalles sobre la ruta complicada que ha viajado la causa en los últimos años. Por ejemplo Delgado explicó que el Papa Benedicto había desbloqueado la causa unas pocas semanas antes de su renuncia, pero que después de su salida el proceso se detuvo de nuevo. A continuación, llegó Francisco y ha ordenado que el caso sea liberado y ahora ha tomado un camino normal, según Delgado. Con este desarrollo, podemos decir verdaderamente que el proceso ha llegado técnicamente a su etapa final. Delgado es de la esperanza de un resultado rápido, en línea con los deseos del Papa Francisco expresados el mes pasado. Delgado confía en que Monseñor. Romero será beatificado “el próximo año, o el 24 de marzo o el 15 de agosto”. Marzo será el 35º aniversario del asesinato de Romero; Agosto será el cumpleaños 98º de Romero. El proceso se inició en 1993 con el anuncio del Arzobispo de San Salvador de su intención de proceder y con el permiso de la CCS para hacerlo. Para noviembre de 1996, la investigación de la arquidiócesis de la causa estuvo completa cuando el arzobispo aprobó las conclusiones de la investigación y envió la documentación a la CCS, y para 1998 todos los registros necesarios se habían remitido a la Congregación. En el año 2000, tras la objeción del cardenal colombiano Alfonso López Trujillo, quien expresó su preocupación por la asociación de Romero con la Teología de Liberación, la causa de Romero fue investigada por la CDF, entonces presidida por el cardenal Joseph Ratzinger, quien después fue elegido Papa Benedicto XVI. Entre 2000 y 2005, la CDF estudia los escritos, sermones y discursos de Monseñor Romero para asegurarse de que estaban libres de error doctrinal. En 2001, el obispo Vincenzio Paglia, postulador de la causa de Romero, celebró un congreso especial en Italia, que reunió a expertos y teólogos para tratar de determinar si las acciones del arzobispo y sus palabras y escritos estaban dentro de la enseñanza autorizada de la Iglesia. Finalmente, la CDF concluyó que “Romero no era un obispo revolucionario, sino un hombre de la Iglesia, del Evangelio y de los pobres”. Posteriormente, la causa fue remitida nuevamente a la CDF al parecer por insistencia de ciertos cardenales latinoamericanos que exigían un estudio de las acciones pastorales concretas de Romero. A partir de entonces la causa estuvo frenada. Poco después de la toma de posesión del Papa Francisco en marzo de 2013, el Postulador Paglia informó públicamente que el Papa en una audiencia privada del 20 de abril de 2013, le hizo saber que estaba autorizando proceder con el proceso de beatificación de Romero. Paglia dijo que el proceso había sido “desbloqueado”. Il «positio super martyrio»—la documentazione sul martirio—di Mons. Oscar Romero di El Salvador già completata, è stata presentata dalla postulazione della causa a quattro teologi della Congregazione delle Cause dei Santi che la esaminano appunto dal punto di vista teologico, ha spiegato mons. Jesus Delgado, vicario generale di San Salvador, a margine dell'incontro della di Sant'Egidio ad Anversa. Quando i teologi hanno finito questo esame passano la documentazione a quattro cardinali, poi alla fine essa va in mano al Papa, dice Delgado. Mons. Delgado è intervenuto oggi a una tavola rotonda su «I martiri nei tempi presenti»: e proprio la figura di Romero, e ha ha fornito alcuni nuovi dettagli per quanto riguarda il percorso complicato la causa ha viaggiato negli ultimi anni. Ad essempio, Delgado spiegato come Papa Benedetto aveva sbloccato la causa qualche settimana prima della sua rinuncia, ma come lui è andato via l’iter si è fermato di nuovo. È poi arrivato Francesco e lui ha ordinato che la causa fosse liberata: e adesso ha preso un cammino normale, secondo Delgado. Con questo sviluppo, si può veramente dire che il processo è tecnicamente nella fase finale. Delgado è fiducioso per un risultato rapido, in linea con gli auspici espressi dal Papa Francesco il mese scorso. Delgado confida che mons. Romero possa essere beatificato “l’anno prossimo , o il 24 marzo o il 15 agosto”. Marzo sarà il 35 ° anniversario dell'assassinio di Romero; Agosto sarà il suo 98 ° compleanno. Il processo è stato avviato nel 1993 con l'annuncio del Arcivescovo di San Salvador della sua intenzione di procedere e con il permesso dei CCS per farlo. Nel novembre 1996 la indagine arcidiocesano della causa ha stato completa quando l'arcivescovo ha approvato i conclusioni dell'inchiesta e ha inviato la documentazione al CCS, e nel 1998 tutti i record necessari era stato presentato alla Congregazione. Nel 2000, dopo un'obiezione da cardinale colombiano Alfonso López Trujillo, che ha espresso preoccupazioni circa l'associazione di Romero con la Teologia della Liberazione, la causa di Romero è stato indagata dalla CDF, allora presieduta dal cardinale Joseph Ratzinger, che in seguito fu eletto Papa Benedetto XVI. Tra il 2000 e il 2005, la CDF ha studiato gli scritti, sermoni e discorsi di monsignor Romero a garantire che sono esenti da errori dottrinali. Nel 2001, il vescovo Vincenzo Paglia, Postulatore della causa di Romero, ha tenuto un congresso speciale in Italia, che riunisce esperti e teologi per cercare di determinare se le azioni di Romero e parole scritte e pronunciate erano secondo l'insegnamento autorizzato della Chiesa. Alla fine il CDF ha concluso che “Romero non era un vescovo rivoluzionario, ma un uomo di Chiesa, il Vangelo e dei poveri”. Successivamente la causa è stata nuovamente deferita alla CDF apparentemente sulla denuncia da alcuni cardinali latinoamericani che chiedevano uno studio di iniziative pastorali concrete di Romero. Successivamente la causa a quanto pare è stato bloccata. Poco dopo l'inaugurazione di Papa Francesco nel marzo 2013, Postulatore Paglia ha riferito pubblicamente che il Papa in udienza privata il 20 aprile 2013, gli disse che autorizza il processo di beatificazione di procedere. Paglia ha detto che il processo era stato “sbloccato”.